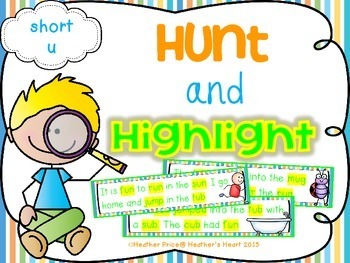 Students will be actively engaged as they read and hunt for words with a short u sound. Students will use bingo chips to cover words on 20 different sentence cards. After covering all of the words with a short u sound, students will then highlight those words on a corresponding recording sheet. Students will also illustrate one of the sentences. 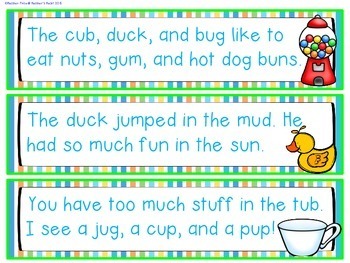 Finally, students will practice reading the sentences 3 times for fluency. 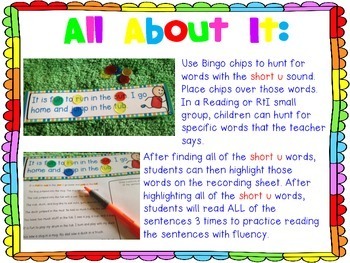 This activity can be used in reading or RtI groups as well as part of a Word Work or Literacy Center. 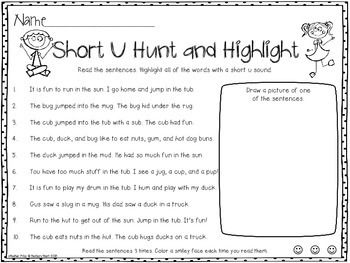 This packet gives students the opportunity to hunt, read, and highlight over 100 words with a short u sound!